Environmentally-friendly polyurethane floor coatings repair and prevent wear, reduce the risk of slips and falls, and provide stain resistance. 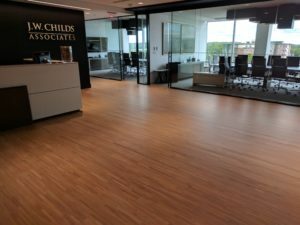 They offer an excellent way to meet the maintenance challenges of hard surface flooring, including concrete, hardwood, ceramic, LVT and resilient tile, terrazzo, and natural stone floors, while adhering to the most stringent U.S. standards with a low VOC content. When J.W. 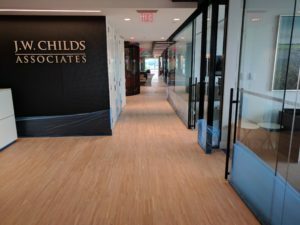 Childs Associates, a Boston-based private equity firm specializing in leveraged buyouts and recapitalizations of middle-market growth companies, had concerns about the appearance of its newly installed teak floor, they turned to Solid Logic for its expertise. The floor was drying out from low humidity and there was visible staining as well as discoloration from sunlight. The floor was not meeting the expectations and high standards of J.W. Childs. Instead of replacing the floor, Solid Logic was able to provide a cost effective, sustainable solution. The 4-mm thick engineered wood floor was too thin to sand, but Solid Logic’s skilled craftsmen were able to delicately abrade and then apply a specialty high-performance polyurethane coating, essentially creating a new floor atop the old one. Unlike a chemical heavy strip wax, this coating required only two coats and is eco-friendly. It makes the floor easier to clean, requiring only light maintenance with a neutral cleaner, and is easily repaired should it be damaged. For more information on protecting your floor with a high-performance coating designed to reflect the needs and use conditions in your facility, contact Sam Hill at 617-666-4000 Ext. 104 or by email at [email protected].